"Are we just as naive in America, even today, as we stand at the global altar, concurrently rejecting and embracing new faces? In our national mind and on our conscience we can hear the first three notes of South Pacific heralding again and again the foreignness and the familiarity of what we face, the potential and the risk. If music can store energy, it can release it." Rodgers and Hammerstein's 1949 musical South Pacific is undoubtedly a genius musical score and a sweeping romance. 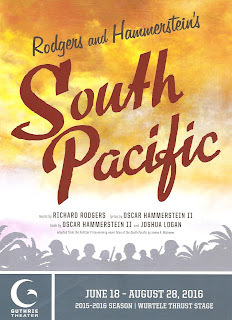 But as the above quote from composer Adam Guettel (grandson of Richard Rodgers) indicates, South Pacific is so much more than just a pretty musical, and was truly ahead of its time. It told a story of interracial relationships 20 years before Loving v. Virginia abolished laws prohibiting interracial marriage. The song "You've Got to Be Carefully Taught" is a brilliant thesis on racism and prejudice. When asked to remove the song because "it's untimely and it's not what patrons want to hear when they go to a musical," Oscar Hammerstein replied, "That's what the play is about!" Nearly seventy years later, with issues of immigration and prejudice on the daily news and in every political debate, South Pacific's themes of fear of the other vs. embracing and accepting the other are perhaps more relevant than ever. It's a perfect choice, then, to conclude Guthrie Artistic Director Joseph Haj's first season, and he does justice to this beautiful and meaningful classic with this wonderful production. Based on James Michener's book Takes of the South Pacific, a collection of stories based on his experience stationed there during WWII, the musical South Pacific is a wartime story that doesn't have a lot of war in it. The soldiers seem to spend most of their time lounging around missing home and trading souvenirs bought from the locals, while the nurses jog around the island and plan variety shows. Ensign Nellie Forbush falls in love with the distinguished French plantation owner Emile de Becque and after a whirlwind romance he proposes. Despite their differences, she's almost agrees to marry him, until she finds out that he has two children with a native woman. Her Southern upbringing has instilled in her that that's wrong ("You've Got to Be Carefully Taught") and she rejects him. And that's when we remember this is wartime as Emile and the handsome young Lieutenant Cable, himself in love with an island woman he fears his Philadelphia family will not accept, go behind enemy lines to gather information. It takes this dose of reality, with the man she loves in danger, for Nellie to realize what's really important, and what isn't. And holding on to old prejudices about the way things are supposed to be is not as important as "when you find your true love." For the last few years, when the Guthrie has announced casting for their summer musical, I've been disappointed to see too few familiar names among the leads. I understand the need to bring in top national talent, but I also know that we have some amazing talent right here in the Twin Cities that deserves to be showcased on the Guthrie stage. Taking a look at the understudy list (always fun at the Guthrie) reveals a dream cast - I would love to see an all-understudy performance featuring Katie Bradley as Bloody Mary, Cat Brindisi as Nellie, David Darrow as Lt. Cable, Michael Gruber as Emile, and Daniel S. Hines as Luther Billis! If they did that on some Wednesday afternoon, I would play hooky to go see it. "There is Nothing Like a Dame!" That being said, the cast is wonderful, even if there's a lot of underutilized talent in the ensemble. Erin Mackey is just perfect as Nellie, funny, charming, and endearingly awkward, like Ellie Kemper but with an effortless and lovely voice. Edward Staudenmayer has a powerful presence and voice as Emile, a voice so powerful I'm not sure it's legal to walk around with it in one's possession. As Cable, CJ Eldred's voice is as pretty as his cheekbones (although sadly they cut his song "My Girl Back Home"). Jimmy Kieffer is a hoot as Luther Billis, scamming the soldiers while being scammed by Bloody Mary (Christine Toy Johnson), and willing to do anything for Nellie. The one local among the leads is Steve Hendrickson, fantastic as always in the role of Captain Bracket. Natalie Tran (one of the busiest child actors in town) and Gavihn Lee are indeed the cutest things ever as Emile's children (they share the roles with Louisa Darr and Sander L. Huyhn-Weiss). The cast of 30 delightfully plays many roles and fills the stage with energetic and fun-to-watch performances. This gorgeous and varied score (including such favorites as the dreamy "Some Enchanted Evening," the haunting "Bali Ha'i," the spirited "I'm Gonna Wash that man Right Outa My Hair," and the playful "Honey Bun") sounds fantastic in the hands of this cast and the ten-piece on-stage orchestra. But I couldn't help but miss the 30-piece orchestra from the Lincoln Center production I saw in 2008, the revelation of which produced an audible sigh from the audience. The sweeping string parts played on a keyboard just don't have the same effect, and don't reveal the full depth of this Tony-winning score. "I'm Gonna Wash That Man Right Outa My Hair!" 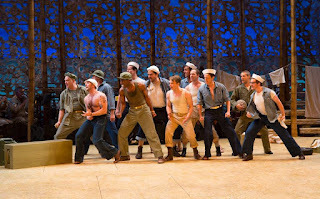 I put South Pacific on my summer theater must-see list, and now I can confirm that it definitely is a must-see summer experience. Perhaps Rodgers and Hammerstein's best work, both musically and thematically, lovingly brought to life by a huge and fantastic cast, with beautiful and evocative set, costumes, and lighting. 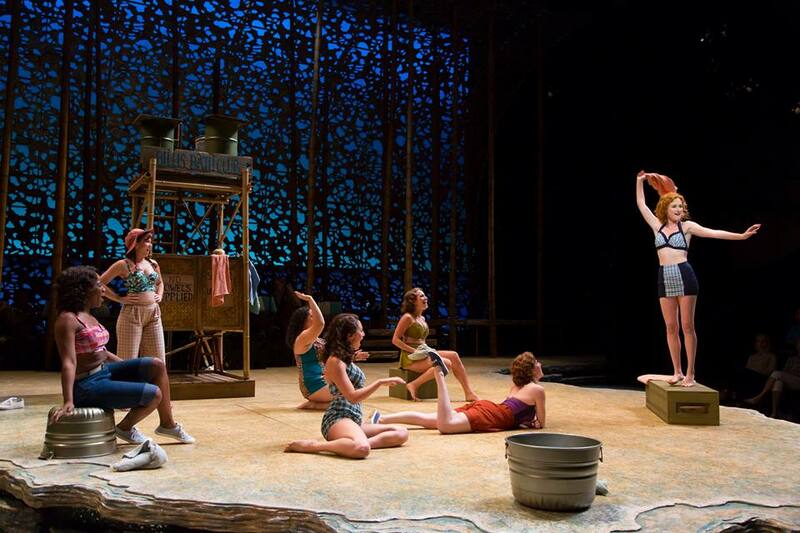 South Pacific continues through the end of August at the Guthrie Theater.